Plains Indians Regalia and Customs by Bad Hand. 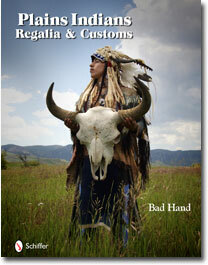 An all new and unique look at Plains Indian clothing , regalia and habits. 95% of all of the 100's of illustrations and text have never been published before or brought together under one cover. It is a straight forward, historically accurate , but perhaps a bit politically incorrect version of what life on the Plains was like in the 18th-19th centuries. brings to life what it may have been like in a 19th Century Plains Indian Village by showing in full color photographs using modern Native Americans dressed in Bad Hand's traditional and authentic clothing and regalia that he made doing typical daily activities. Contact us for Author signed copies which are $20 plus $6 S & H.
"Thru the various mediums I use, whether it be my book, "Daily Life in a Plains Indian Village", lecturing, making replicas, or doing films, I try to share with people my enthusiasm for and knowledge of the 18th & 19th Century Plains Indian culture. Bringing it to life in living color, smells and textures helps all people feel in touch with that culture. I believe it reminds people of all races that we share the same roots . . . we all lived in a tribe at one time, living in and with nature. We all had chiefs and shamans and lived in large extended family units. For most cultures and races that way of life is many centuries removed and little remains of their material culture, religions, and beliefs. I feel that all races have perhaps a collective memory of those times and thereby feel a connection with early Native American culture. Helping people feel and make that connection is one of the focuses of my life . . . ."